The launch of the new Maserati history: “Maserati, the Family Silver” by Nigel Trow was held on 3rd November at Maranello’s Tower Garage in Egham. 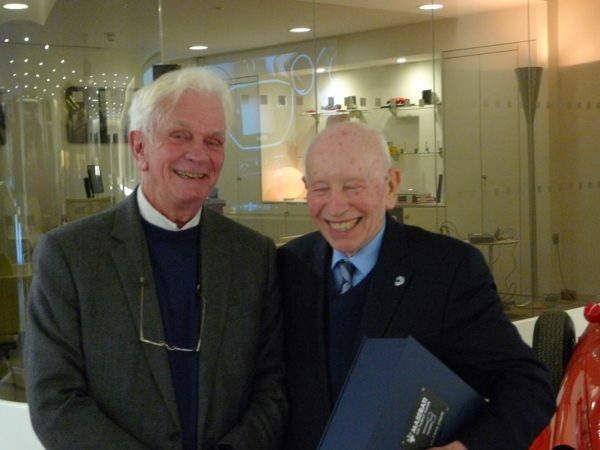 The guest of honour, John Surtees, is seen here accepting a unique copy of the book from the author, in celebration of John’s famous connection with the Maserati name: his victory, 50 years ago this month, in the 1966 Mexican GP, driving a Cooper-Maserati. John Surtees delighted guests with his enthusiastic reminiscences of the challenges, the disappointments, but finally the rewards of the team’s hard work that led to his win in Mexico. “Maserati, the Family Silver” is the result of 14 years of research by Nigel Trow, and sets out the story behind the Maserati marque, as well as that of the Maserati and Orsi families. It is published by Plenham Press. The launch event also brought together a fine selection of Maserati cars old and new, from Nick Mason’s 250F to the latest 2017 Quattroporte, also launched on the same evening.